Interface, a leading global commercial flooring company and worldwide leader in sustainability, today closed its previously announced acquisition of nora systems via a stock purchase transaction. Interface agrees to acquire nora systems, a global leader in performance flooring and worldwide share leader in the rubber flooring category. Interface now offers carbon neutral products across entire global product portfolio. Interface's Human Connections Collection responds to increasingly tech-driven working environments and our innate need to connect with each other and the outdoors. Interface today unveiled a first-of-its-kind prototype carbon negative carpet tile, proving that it is possible to store carbon in products rather than emit more carbon into the atmosphere in the process of making those products. 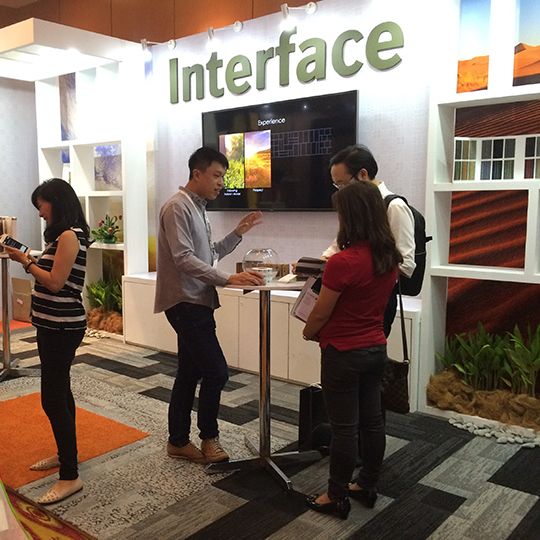 Interface inspires with its new mission and 2016 global product collection at Archidex, one of the region’s biggest trade shows in architecture and interior design. Our booth was fitted with the tweed-inspired World Woven Collection, while wall graphics took visitors through the company’s 2016 campaign ‘From something negative comes something positive’. During the recent NeoCon trade show in Chicago, US, Interface publicly announced our new mission – Climate Take Back – to VIP customers and media. Interface Asia is proud to be the Platinum sponsor for the FuturArc Prize 2016. The prize is part of the BCI Asia Awards, held every year to recognise the leaders in architecture and construction. The award ceremonies this year were held in Singapore, Vietnam, Indonesia, Malaysia, Thailand, Hong Kong and Philippines, during the months of May and June. Interface introduces World Woven™, a global collection of Skinny Planks™ and squares that is deeply influenced by the timeless familiarity of local textiles found around the world throughout history. GlobeScan and SustainAbility released the results of their annual Sustainability Leaders survey at this year’s Sustainable Brands conference. When asked, “which companies do you think are leaders in integrating sustainability into their business strategy?” respondents have, for the past 19 years, consistently mentioned Interface, an Atlanta-based global manufacturer of modular carpet that is a leader in sustainable business. Interface has the longest-running tenure on the list and is the only company to be named in the top four since 1998. Interface receives the prestigious ARCA's Eco-green Outstanding Leadership Award, the highest tier of the Singapore Built Environment Building (BEI) Asia Awards. Two recent carpet tile offerings from Interface, Equal Measure™ and Near & Far™, have received top industry honours this fall in the United States and Canada. Recent awards for the global collections include the coveted Interior Design Best of Year designation, an Architectural Products Product Innovations Award, and two IIDEXCanada Innovations Awards. Interface was voted the No. 1 choice of contract interior designers in Floor Focus' annual Top 250 Design Survey, taking the top spot in service, quality, design, performance and green leadership - 4 out of 5 categories. Interface delivers progress report on the Net-Works program expansion at 2015 Clinton Global Initiative. At ARCHIDEX 2015 Interface offers visitors inspiration and education around how to design interior spaces that can increase employee well-being, as well as introduces a range of products in Interface’s signature Skinny Planks™ format. Today, Interface, along with conservation charity the Zoological Society of London (ZSL), provided an update on the progress of Net-Works in the Philippines. Funded in part by United Kingdom government’s Darwin Initiative, Net-Works is primed for global expansion of this programme. Interface India has launched its new initiative “Office on Wheels” in Hyderabad. The Interface “Office On Wheels” is a mobile vehicle which will be parked near the offices of prominent architects and designers to offer a convenient and engaging experience, whilst showcasing the latest collection Human Nature™. A global study commissioned by Interface and led by renowned organizational psychologist Professor Sir Cary Cooper, the Human Spaces Report reveals that employees who work in environments with natural elements report a 15% higher level of well-being, are 6% more productive and 15% more creative overall. Interface is delighted to announce it will join the FairBuilding Network as Platinum Partner. The partnership forms part of Interface’s commitment to being a restorative enterprise that operates through socially inclusive business models, and to develop and strengthen similar practices within the industry. Interface is launching its dedicated hospitality offering in Asia following successful roll-out in the USA and Europe. Interface Hospitality is part of the company’s strategy to expand its business beyond its corporate office heartland. 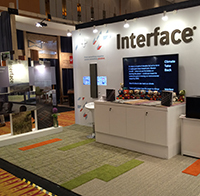 Interface becomes the first global manufacturer to offer customers carpet tile recycling in Asia. Strategic partnerships ensure that carpet tiles suitable for recycling are diverted from landfill, allowing customers to recycle within the region.